(līkăn`thrəpē), in folklore, assumption by a human of the appearance and characteristics of an animal. Ancient belief in lycanthropy was widespread, and it still exists in parts of the world. Certain African tribes have their "leopardmen" and the like, and literatures all over the world have tales of men changing to animals. One of the most widely held of these superstitions is the belief in the werewolf (a person who either willingly or unwillingly changes into a wolf, eats human flesh or drinks human blood, then returns to his natural form). The lycanthrope, akin to the vampire, is thought to undergo his change by means of witchcraft or magic. In the Middle Ages the church condemned lycanthropy as a form of sorcery and often ruthlessly punished the supposed offenders. The term is also applied to a form of insanity in which a person believes himself to be an animal and behaves accordingly. 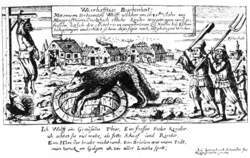 Werewolf of Eschenbach, 1685. Courtesy Fortean Picture Library. The transformation of a human being into the form of a wolf. From the Greek lukos, a wolf, and anthropos, a man. Such a human, transformed, is known as a werewolf. This, in turn, comes from the Anglo-Saxon wer, man, and wulf, wolf. There are many folk tales of werewolves in all countries of the world where wolves are, or were, found. In other countries that have not known the wolf, there are folk tales of such things as weretigers, -bears, -leopards, -panthers, or -foxes. Some people believed that the transformation took place solely in the mind of the person. In other words, no physical changes took place; the affected person simply believed that the changes had taken place. Yet there were many well documented cases—several in France in 1598, for example—that seemed to prove otherwise. During the time of the trials for witchcraft at the end of the sixteenth century, there were a number of cases of lycanthropy. Geiler von Kayserberg's book on witchcraft, Die Emeis (Strasbourg, 1517), contains an illustration of a man being attacked by a werewolf. The Révérend Père M. Mar. Guaccius's Compendium maleficarum (Milan, 1626) has an engraving of a witch turned into a wolf. Various German works of the sixteenth and seventeenth centuries also show such pictures. In many of the British witch trials evidence was presented of witches transforming themselves into a variety of animals: rabbits, hares, cats, dogs, mice, crows, and wolves. In 1573, Gilles Garnier of Dole, France, admitted to becoming a werewolf and killing a ten-year-old girl, tearing her body to pieces with his teeth and claws. In 1589, Peter Stumpf of Bedburg, near Cologne, under torture admitted that he changed into such an animal with the aid of a magic belt that the devil had given him. He could change back into a man, he said, by removing the belt. Among others, Stumpf killed his own son and twelve other children, plus two young women and various livestock. He was sentenced to be horribly tortured then burned alive at the stake, along with his daughter. Vergil, the Roman poet, in his Eclogues (c. 20 BCE), wrote, "Often have I seen Moeris turn into a wolf and hide in these woods: often too have I seen him summon the spirits from the depths of the tomb and transfer crops elsewhere." Pliny the Elder (23-79 CE) spoke of one of the clan of Anthius, who was chosen by ballot of the family and led away to a certain pool in the region of Arcadia. There he hung his clothes on an oak tree, swam across the pool, and went into the woods on the far side to transform into a wolf. He remained in that form for nine years before swimming back across the pool and changing back into a man. According to William Stokes (Religion of the Celts, 1873), St. Patrick cursed a certain race in Ireland so that every seven years they and their descendants would become werewolves. 4) In two excellent articles on reading the menstrual monster in Ginger Snaps that were published in 2005, April Miller emphasizes the film's use of lycanthrope folklore to underline "the limits placed on female sexual subjectivity" (281), particularly as such limits may be defined in the morbid sameness of Bailey Downs as a "Stepford community" (290), while Aviva Briefel uses Ginger Snaps in her examination of the feminist possibilities of the onscreen menstrual monster. A commonplace in typological studies of medieval lycanthropes (see, e.
For years, Timothy has resided peacefully with widowed mom Rachel (Rhona Mitra) in Huguenot, a secluded small town where, apparently, each of their friends and neighbors--including Jonas (Elias Koteas), Rachel's brother-in-law--is a reluctant lycanthrope. Last Saturday at the weekly Uncle Albert's free gig Russell And The Wolves were at the height of their lycanthrope powers as Ned and Danielle were laying down those spiky reverb guitar lines. Evil lycanthrope Varek (Jason Behr) and his clan attempt to kill Timothy, thereby ensuring their reign of terror over the humans continues indefinitely. When the wolf-guy tracks Brigitte down, she and Ghost escape to the latter's empty rural home, where they arm themselves against the relentless lycanthrope pursuer. Colin Tierney's Ferdinand - a lycanthrope whose horrible laughter has chilled our bones for centuries, resembles nothing more than a tame fashion model, while Antonio, the Duchess's steward is a grey-flannel suited, collar and tie bank manager. These God of War-inspired stages, which see Sonic shape shift into a lycanthrope, are cumbersome and are in sharp contrast to the bright and zesty day time levels. To be honest, I begin to panic a bit when my nails get to the long and curly stage in case I trigger an irreversible change in my metabolism and I wake up one morning as a fully fledged hairy lycanthrope who howls at the moon. This time around we're in Llanwelly, Wales, where Chaney's character is bitten by a lycanthrope (played by Bela Lugosi). Fear not, it'sWales' top 10 horror flicks..
What mythical creature could be called a lycanthrope - a vampire, a werewolf or a zombie?